This is actually not about Dean Martin’s Christmas Classic which has suddenly been deemed inappropriate. It is about finding nearly everything inappropriate these days. Is that a ban on Christmas or what? It also sounds like there was a lot of confusion among the staff prior to the issuance of the email, doesn’t it? The new principal of Manchester Elementary must be a rock climber who had no intentions of backing down in the face of any giants. It seems that “Amy” was the principal last year. Amy offered a pretty “matter of fact” reference to school policy instead of the detailed itemization provided by the new principal. The school policy referenced by Amy has a few interesting references in it, but nothing which could rise to the level of the ban issued this year. You might think this is a bad policy, but it is actually a good policy since there can be teachers with beliefs which are totally contrary to your faith. I would not want any teacher teaching children to worship trees or some variant of Zues, so I’m okay leaving worship to times and places other than the public schools. If a cross, a creche (a nativity scene with Mary, Joseph, Jesus, etc…) Christmas tree or Santa Claus is acceptable under the school district’s policy, how can playing Christmas music be deemed unacceptable? 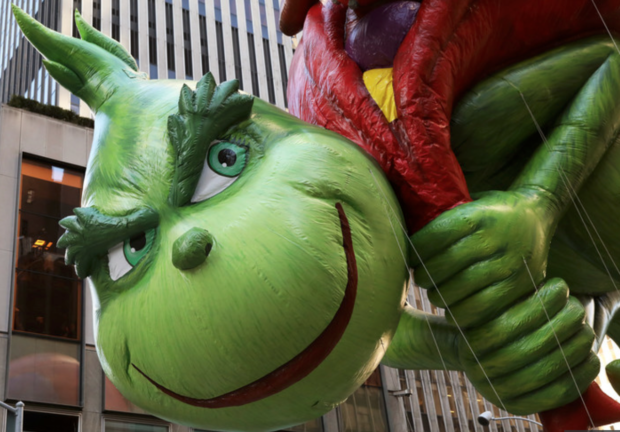 Secular Christmas songs are abundant. Rudolf the Red Nosed Reindeer, Frosty the Snowman, Jingle Bells, etc…, are all childhood favorites which promote no particular faith at all. Why eliminate this from a teacher’s options if they want to add some joy to the school day? I was in Bethlehem and Nazareth last Christmas, and in those cities, which are about 99% Muslim, there are huge Christmas trees and nativity scenes in their town centers. If Muslims are okay with Jesus, why are we banning Him from our public schools in which the student body is predominantly Christian? The official polices allow it. 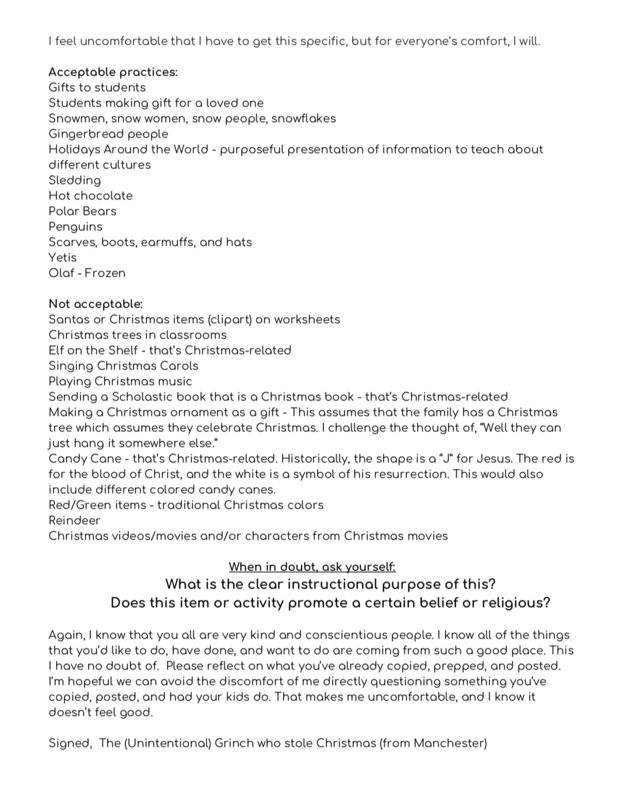 According to the policy, it would actually be permissible for a teacher to play a Christian Christmas song such as Joy To The World, as long as the teacher used the opportunity to teach why Christians have tied “joy” to Christmas for centuries. That would certainly be pushing it if the environment were anti-Christian at Manchester Elementary, but it would be perfectly in line with the policy. How about the candy cane prohibition? I’m not a big fan of candy canes. I’ve been a Christian for fifty years, and I have never heard that the red and the white colors of a candy cane are supposed to symbolize Christ’s blood and resurrection. Nor have I ever heard that they are bent in the form of a “J” for Jesus. Although, I may think of candy canes in a much more positive way now. Also, do we really have to refer to certain cookies as people, as in “gingerbread people“? Did the principal of Manchester Elementary expect her staff to intentionally spend the next 30 days selecting wardrobe combinations which did not have both red and green as colors? Apparently that may cause the principal to go through the uncomfortable procedure of directly questioning whether their wardrobe selection was a coded attempt to convey a Christian message to unsuspecting grade schoolers. What is the principal’s motive in all of this. 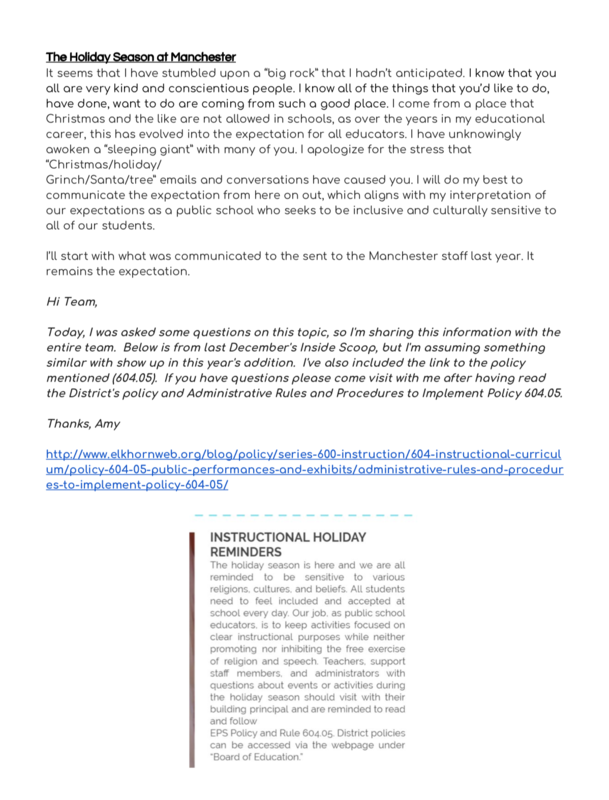 Did she simply misinterpret the school policy and think that by outlawing Christmas, she was somehow reflecting “the diverse heritage of the United States” as is stated in the policy? She seems too bright to misread the policy that badly, but she could have been influenced by personal beliefs or experiences to interpret things incorrectly. Maybe she has been conditioned to crack down on Christians each December due to her prior employment? However, her prior employer was Hillside Elementary, which appears to place no restrictions on how Christians celebrate religious holidays. Is it possible that she is actually personally hostile toward Christianity and has decided to impose her own views on her staff and the students of Manchester Elementary? I should hope not. Again, she sounds very misguided. There is no evidence that she harbors an anti-Christian agenda. Therefore, Manchester Elementary and its principal do not need mean-spirited emails, snarky letters, rude calls, etc… Prayers would be perfectly appropriate though. If the principal does have anti-Christian beliefs, she’s not going to be evangelized by anyone’s anger. Besides, the school board has reversed the ban. The staff and students may now enjoy the days leading up to Christmas if they like. Nobody was hurt in this. All persons have a natural and indefeasible right to worship Almighty God according to the dictates of their own consciences. No person shall be compelled to attend, erect or support any place of worship against his consent, and no preference shall be given by law to any religious society, nor shall any interference with the rights of conscience be permitted. No religious test shall be required as a qualification for office, nor shall any person be incompetent to be a witness on account of his religious beliefs; but nothing herein shall be construed to dispense with oaths and affirmations. Religion, morality, and knowledge, however, being essential to good government, it shall be the duty of the Legislature to pass suitable laws to protect every religious denomination in the peaceable enjoyment of its own mode of public worship, and to encourage schools and the means of instruction. Nebraska’s constitution recognizes that “religion, morality, and knowledge, [are] essential to good government”, and the U.S. constitution prohibits the government from interfering with the free exercise of religion. In other words, religion is good, and the separation of church and state is not meant to keep religion out of government (including schools), it is meant to keep government out of our faith. December is here, which means Christmas is coming. I’ve included the link to a relevant policy (604.05). If you have questions please come visit with me after having read the District’s policy and Administrative Rules and Procedures to Implement Policy 604.05. As you can see, that is really similar to Amy’s notice from December 2017. And such a notice reminds teachers and staff that if a student wants to express some sort of celebration of a non-Christian holiday, the student’s desire should be respected as much as the Christian student. This would even allow a teacher to recognize a Jewish or Muslim holiday. Now that sounds more fair, doesn’t it? Faith is legal in our public schools. Students can pray and conduct Bible studies and organize pro-life groups; teachers can use the Bible in class as long as they are not worshiping or evangelizing; people can wear crosses and crucifixes, etc… And people can possess candy canes. Thanks to the parents, apparently some teachers, and the school board, Manchester Elementary’s Christmas ban has been lifted. However, something tells me it is a little chilly in Manchester Elementary today. Hopefully there can be a little Christmas cheer before Christmas break.